This could not be any easier. Remember that Onion Jam I made last week, this comes into play to add a depth of flavor to this quick and satisfying 5 minute lunch or can be made as a side dish for dinner any night. 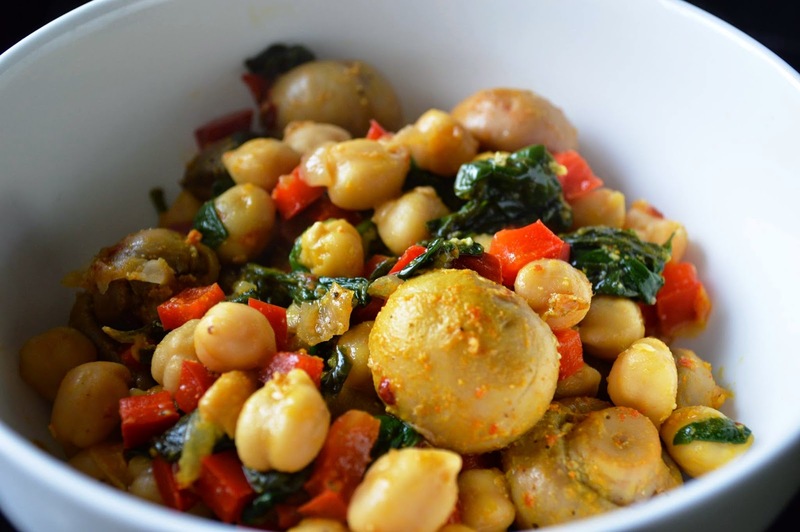 Saute spinach till wilted but still green then add chickpeas, bell pepper and mushrooms. Once heated through, about 3 minutes, add onion jam, lemon juice, garlic powder, Sambal and Turmeric. Mix well and serve either as is for a lunch, over rice or couscous for a heartier meal or as a side. The heat can be adjusted to your taste, we like a spice that lingers but doesn't make you grab for a fire extinguisher.